Your beer is green, and your plate is full of cabbage and corned beef — It must be St. Patrick’s Day! No matter how you plan to celebrate, make sure your pet has a good day, too. Traditional Irish foods such as sauerkraut, cabbage or corned beef are NOT good for you dog or cat. Foods like this can really do a number on your pet’s stomach. Just because your pet ages seven times faster than you doesn’t mean it’s old enough to drink. In fact, alcohol is NEVER good for pets. Also, green food coloring could cause intestinal upset as well. Is your pet one who gets nervous around strangers? 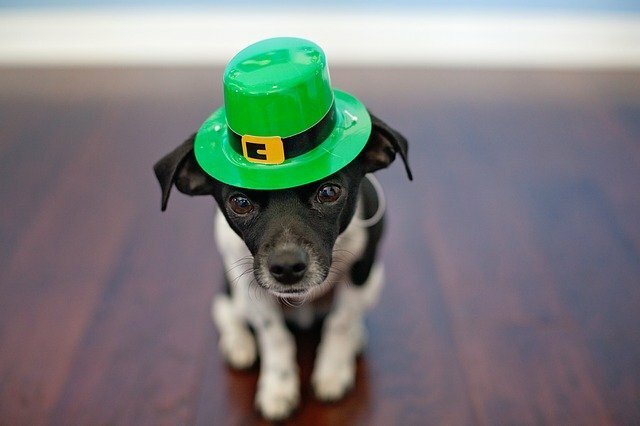 If you are hosting a St. Patty’s Day party, consider putting your pet in its own quiet room away from all the festivities. Likewise, some people are not “pet people” or have pet related allergies, so you may want to consider who you invite. Finally, even pets that like people can get agitated in a party, and might lash out. This is especially important to consider if there will be children at the party, because they don’t have the same boundaries as adults. Please call our office at 410-687-1111 with any questions you may have regarding keeping your furry family member happy and healthy this St. Patrick’s Day.